February 4, 2014, 12:31 p.m.
Monday night at the Central Library author Barry Miles and I discussed the life and work of William S. Burroughs, whose 100th birthday is on Wednesday. Burroughs, of course, was one of the great iconoclasts of 20th century literature: progenitor of the Beat generation, titular godfather of punk. That he tended to eschew such labels (“You must learn to exist with no religion no country no allies,” he declared in his 1969 book “The Job.” “You must learn to live alone in silence”) only makes him more compelling: a writer who, for the bulk of his career, looked for ways to confound and provoke. That letter is quoted in Miles’ new book, “Call Me Burroughs,” the first full biography in a quarter of a century and the only one published since the author’s death, at 83, on Aug. 2, 1997. 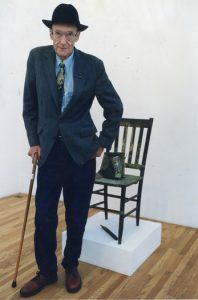 Miles knew Burroughs for more than 30 years; he cataloged his archive and wrote an earlier book about him, 1993’s “William Burroughs: El Hombre Invisible.” In his view, the author’s legacy has to do with his belief in language as a control system, a set of precepts by which we are programmed, inculcated, into a particular relationship with, or take on, the world. This is the famous “language is a “virus” dictum, and it explains Burroughs’ lifelong move toward silence, his desire to “rub out the word.” But if his body of work has anything to tell us, it’s that language, even as a control system, can be rerouted, that we can always find a way to use it for our own purposes. For Burroughs, this had a lot to do with the cutups, a collage approach to writing that he discovered, in conjunction with the artist Brion Gysin, in 1959, shortly after completing “Naked Lunch.” The idea is simple: to juxtapose different bits of text, cut into pieces and then arranged together, as a strategy for subverting the intention, the direction, of narrative. In Burroughs’ greatest cutup experiments — the novel “The Soft Machine,” for instance — content, meaning, is disregarded in favor of a dreamscape of recurring images, as if the text could work directly on the subconscious, provoking (yes, that word again) associations that might otherwise remain unmade. Miles compares it to the “high modernism” of Djuna Barnes, but if that seems a little overstated (Burroughs’ intentions were less about expanding our relationship with language than undermining it), there’s no question that he meant to change the way we interact with words. By the time I met him, Burroughs had been burnished by age and reputation; he came off as a kinder, gentler outlaw, accessible, if gruff. That was, in part, a function of the reading tours he began to do in the late 1970s, at which he would perform various “routines” from his novels: scabrous, cynical, but most essentially funny, like a kind of literary stand-up with an edge. It is this image of him that resonates, if indeed an image of him resonates at all. And yet, on the eve of his 100th birthday, I want to suggest that we look deeper, to remember the writer, not the personality, to reflect on how prescient, how searing his work truly was. Burroughs has been criticized for touching on the same themes over and over, for his over-the-top sense of satire, for the sexual violence of his work. All that is true but also entirely beside the point. What he was getting at, after all, was something deeper, the underside of our collective mythos, the dark heart of the American dream. This is Burroughs as “recording instrument,” reporting back from the front lines of his own consciousness, telling us what he sees. I almost wrote waiting for us to catch up, but that’s the thing about Burroughs: He didn’t care if we caught up with him, and he wasn’t waiting for us to do anything.